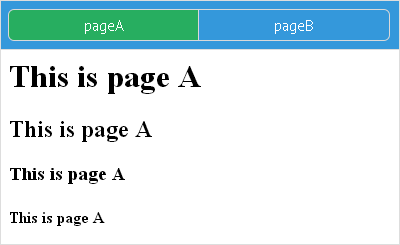 Ui-related IFrame is a component that helps include an i-frame, or 'inline frame' into the page. Basically, it's a floating frame on the web page that contains an external web document. The component, as a rule, is smaller than the page it's added into, so vertical and horizontal scrollbars appear. You can insert more than one IFrame into the view provided that you initialize a switching control for them. The component inherits from view. src (path) - defines external site url. as parameter of the load method. Simply put, this is the basics of multiview functionality. Make use of any of the integral buttons (segmented or tabbar) to enable switching. The values for button options will be necessary URL-s.
Then, attach a switching function to the button. The event referring to a tab mouse click is called "onAfterTabClick". The event fires on clicking any tab, takes its ID as a parameter and sets the source for external web page equal to this ID.